The theme of this blog post is new experiences! “An interaction with something new usually has a good outcome”. Learning this lesson really well gives your puppy the flexibility and coping skills needed to become an easygoing, adaptable and friendly adult dog. What? Puppy classes, a friend’s house, the vet’s office, pet boutiques, the groomer’s, shopping centers, busy areas on the street, restaurants with outdoor seating, a college campus, elevators, the hardware store, the local ice cream shop, car trips, and more. Puppy’s Perspective: Each new location has new smells, obstacles, people, dogs, objects, sounds, etc. It’s a lot to take in and handle. Your puppy views each new environment as a foreigner visiting a new country. Focus: Make sure your puppy is current on vaccinations. Spend enough time in each place to give your puppy a chance to explore and get comfortable. If possible, play with your puppy in the new setting or scatter yummy treats for him to find. Who? Different sexes and ethnicities, kids, seniors, people on crutches, people that move erratically, strangers visiting your home, strangers out and about, people carrying things, people on wheels (bikes, skateboards, wheelchairs, etc. ), people wearing something bulky or unusual (sunglasses, hats, uniforms, etc.). Puppy’s Perspective: Each new person comes with a new smell, speech, clothing, behavior, and attitude toward dogs. And just like us, dogs have greeting customs. They like to sniff each other out and evaluate the situation before moving to the next step—the equivalent of a handshake before a hug. It can be a bit of a culture shock to dogs when people skip the getting-to-know-you stage and go straight to the we-are-going-to-hug-and-pet-you stage. 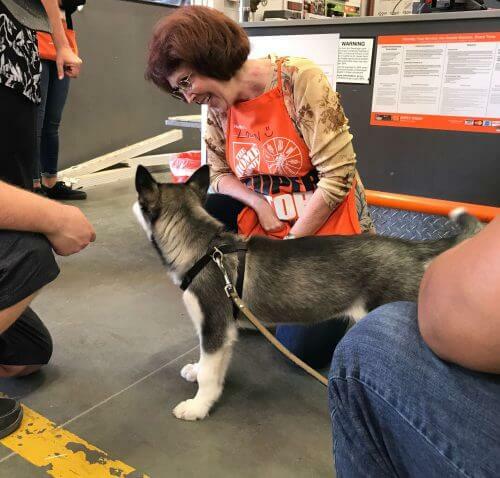 Focus: Asking a stranger to give your puppy some treats or offer a favorite toy not only serves as a great icebreaker, but also creates a positive association with meeting new people. Some puppies immediately love to be cuddled, while others do not. Either way, it’s extremely important to create a positive association both with strangers who enter your home and with strangers you meet outside your home. Who? Babies, toddlers, quiet kids, screaming kids, running kids, playing kids, crying kids, etc. Puppy’s Perspective: Kids deserve their own category because dogs perceive them differently than they do adults. Kids are small, unpredictable, loud, they move quickly, and use their hands and mouth to explore things. Puppies need a lot of exposure to kids before 4 months of age to learn to accept kids when they’re adult dogs. Focus: Ask kids to give your puppy treats from a bowl or cup instead of their hands to avoid any puppy nipping. Getting pups used to the sounds kids make can really help. Teach your puppy a cute trick he can perform for kids, so the kids can cue the trick and wait for it to happen instead of instantly trying to hug, pet, and generally mug your puppy. What? Dogs and puppies (big, small, quiet, barking, bouncy, long-haired, short-haired, prick-eared, floppy-eared, etc.). Puppy’s Perspective: Just as people don’t like everyone they meet; puppies can’t be expected to love all dogs. Some puppies prefer other puppies, some prefer calm adults, and yet others like rough-and-tumble dogs. Dogs communicate primarily through body language and are carrying on “conversations” before they actually interact. If your puppy generally likes interacting with other dogs and suddenly shies away from one, he may be picking up on signals you don’t see. Focus: Positive experiences with other dogs are vital to your puppy’s socialization. Make sure your puppy plays off-leash at least 3-4 times per week with different dogs, and sweeten all first encounters with treats and praise. What? Sounds are often overlooked as part of a puppy’s socialization and are especially important for urban dwellers. Common sounds that cause problems are people/dogs walking by your home or apartment, other dogs barking, loud sirens, fireworks, babies crying, trucks, etc. Puppy’s Perspective: Dogs have a natural inclination to be vigilant of sudden changes in and directly outside the home. They bark to alert you that there’s a disturbance and also to let the disturbing element know that they reside here. Focus: While a certain amount of barking is okay and to be expected, continuous barking is both annoying and problematic when you have neighbors. To prevent your puppy from become a habitual barker, create positive associations with the most common sounds heard outside your home and give him something else to do when he hears the sound. Coming to you and sitting, for example, or finding a favorite toy. Don’t wait for problems to develop. When you hear the sound, immediately reach for the treats or start playing a game with your puppy. What? Regular vet visits are an important part of being a puppy parent. Vet visits include all kinds of activities that don’t occur in your puppy’s everyday life, including being examined on a table, being restrained and handled all over, and getting shots. Puppy’s Perspective: Most of us only take our dogs to the vet for routine examinations, spay/neuter, or when they’re sick. After a few, unhappy visits of this nature, your puppy may decide that the vet clinic isn’t a good place to be and may become fearful or aggressive during visits. Focus: First impressions are very important. Arrange to visit your vet simply to allow your puppy to get used to the environment and to your vet without having to get shots or be restrained. Introduce your puppy to the equipment commonly used by vets and let him have fun and explore while giving him lots of yummy treats. Visit the lobby, play a game, dish out some yummy treats, and then leave. A positive association with vet visits can help reduce your puppy’s stress when he’s sick and prevent the need for a muzzle during visits. What? Trucks, vacuum cleaners, motorcycles, buses, ambulances, garbage trucks, lawn mowers, construction equipment, airplanes, helicopters, etc. Puppy’s Perspective: Ever watch the movie Godzilla? For puppies, encountering their first garbage truck or an ambulance nosily crashing by can be very much like seeing Godzilla in real life. And even the best breeders don’t have the ability to expose their puppies to airplanes, trucks, etc. Chances are the first time your puppy will come across this type of situation is with you. Focus: If possible, find a safe area for your puppy to play where he can hear the sounds of trucks, buses and construction but not see them. If a puppy is familiar with the sounds trucks and buses make before he meets them on the street, he’s much better equipped to handle it. Be ready to jolly him up with play or his favorite treats as soon as he sees or hears a loud moving thing.